The Tommy Moose® program is easily one of the most successful Community Service outreach programs in the history of the Loyal Order of Moose. Its success lies in its simple message and uncomplicated structure. Moose Lodges and Chapters across the U.S. and Canada have purchased over 100,000 Tommy Moose plush dolls and presented them to Police, Fire, and other Emergency Workers, to be carried in their vehicles. 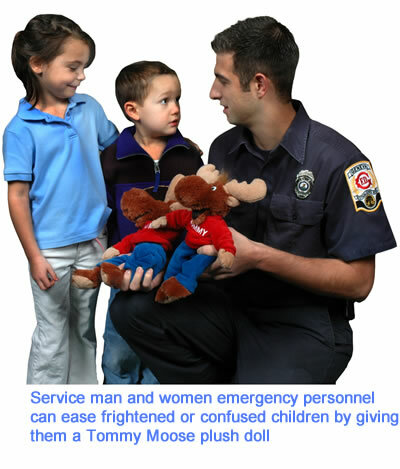 The Tommy dolls are given to children who have been encountered during stressful or traumatic situations, calming them, and giving them a soothing object to refocus their attention toward, while emergency aid takes place. Use the links below to help you in planning your Tommy Moose event.